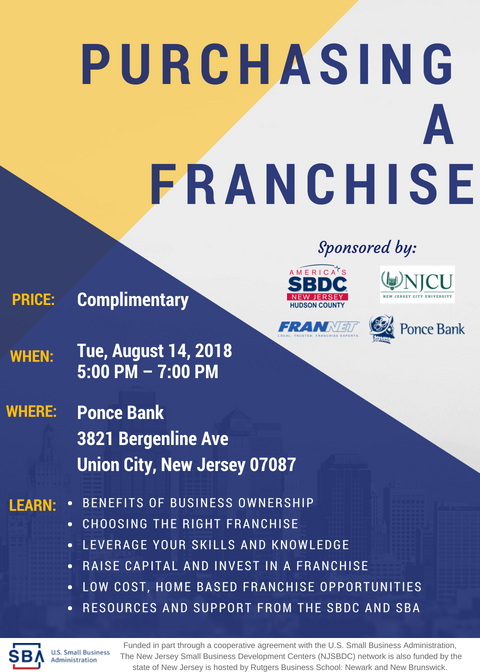 An in-depth workshop hosted by the Small Business Development Center at New Jersey City University and presented by Frannet. Boynton R. Weekes was born in Atlantic City, N.J. and reared in Camden, New Jersey. Boynton is a graduate of Camden High School and Fairleigh Dickinson University (B.A. Business Management). Boynton has nearly 20 years of franchise experience where he has worked and received numerous awards & achievements. In July 2001, Boynton along with (2) business partners founded Global Franchising Group, LLC located in East Brunswick, NJ where he served as the Director of Regional Operations, Franchise Sales and Real Estate Development. Global Franchising Group served as the Master Franchisee and Sub-franchisor in North Jersey & North Eastern, PA for Fantastic Sams Franchised Hair Salons which has over 1350 locations and is ranked #39 (Top 500 Franchises) by Entrepreneur Magazine. As a Sub -franchisor, Boynton assisted his franchisees with marketing, management, advertising, real estate site selection and negotiations, recruiting and retention planning, and obtaining business financing. He has since opened over 23 locations throughout North Jersey and Northeast Pa. Global Franchising Group LLC was sold to the parent company in June 2012. Boynton currently owns BRW Franchise Consulting LLC and in partnership with FranNet of New York and New Jersey, he oversees program coordination of 21 SBDC’s multiple SCORE chapters in both New York and New Jersey. As a Franchise Consultant, his primary responsibility is assisting clients with navigating the myriad of franchise opportunities and determining which franchise brand is most suitable for them, based on their individual transferable skill sets and personal and financial goals. Boynton is actively involved in community service work. He sits on the Growth and Redevelopment committee for the Township of Lawrence. He also is Executive Director of S.C.O.R.E. (Sigma Community Outreach and Empowerment Inc.) a non profit youth mentoring group where he currently mentors (35) young men in Trenton N.J. between the ages of 8 and 18. Boynton is a member of Princeton Toastmasters and is married with three children and currently resides in Lawrenceville N.J.
Metered parking & Parking lot behind the location.